My husband wrestled another really, really, really good book out of my hands and forced me to read Orphan Train. He said I had to read this book before I could have the other one back because this book was a book club assigned reading and the discussion date was quickly approaching. Fortunately for me, Orphan Train was an equally good book and I had no trouble immersing myself into the historical story that unfolded on its pages. Orphan Train is a fictional novel based on true events that was written with those in grades 9 through 12 in mind but that is suitable for all ages, not just children. It tells the story of orphaned children between the years of 1854 and 1929 who were rounded up in the cities of the East Coast of the United States and put on trains destined for towns near the farms of the Midwest. It chronicles their lives before, during and after the train ride, flipping back and forth between the Maine of today and the Minnesota of the Depression. It tells a story of struggle and strife, love and despair, second chances and love, focussing on two main female characters, Vivian Daly, a 91-year old whose life path was altered by her trip on the orphan train and Molly Ayer, a 13-year old modern-day orphan who is struggling to find herself. It is, most definitely, a coming-of-age novel that looks at the events that shaped two females of very different generations. Are There Any Issues With This Book? Some in my book club and of course many other readers have expressed disbelief at a life changing choice made by one of the major characters later on in the book. Others agreed with the author's and the character's decision and could understand why she might have made that decision. I uncovered a video in which author Christina Baker Kline explains her decision about that moment in the story. I am sorry to be cryptic but do not want to give away any secrets in my review. That video, Christina Answers Top 10 Book Club Questions, is a spoiler. I do not recommend it unless you have read the book first. Guest commenter Cynthia, thought the book well worth reading. However, she cautions that "It does use a lot of expletives that she is not used to reading (though she hears them) and that it does get a bit too graphic at one point, but says that she thought it was realistic." Adding, "As long as readers understand things get a little "tough" then she would definitely recommend reading it." Yes, YES, yes. I definitely would recommend this book. 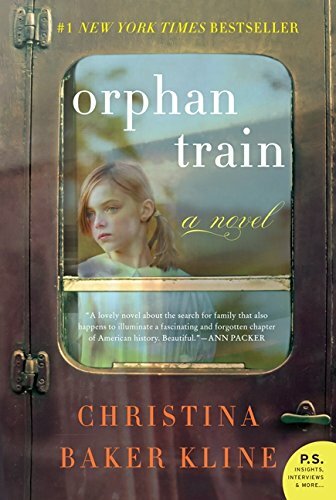 Christina Baker Kline's Orphan Train spent more than 90 weeks on the New York Times best seller list with five weeks in the number one position and more than a year in the top five books on that same list, which really vouches for the book. However, it is important to know that it is a very well written, easy and interesting read that harkens back to a part of American history that was not always pretty. Amazon says that Orphan Train is both rich and epic. That it is powerful, sharing a story of change and strength, friendship and secrets. I agree. It is a great story, one that you will not want to put down until you find out what happens to Vivian and Molly. Order your copy of Orphan Train from Amazon. Read about Canada's fictional orphan, Anne of Green Gables. I briefly know the history of the Orphan Train, but have not read this book. It is now on my "Must Read" list of books as I'd like to learn more about the Orphan Train and now really want to know what happens to Vivian and Molly. Your 'teaser line' has me intrigued. Very interesting book review. Now go finish your other book! LOL. I enjoyed this book very much. I was familiar with the orphan trains of the 19th century, but didn't realize it went on for as long as it did. Susan, I guess I exaggerated when I said wrestle. He really took the other book hostage, LOL. Can you picture that? Linda, I am glad you enjoyed it, too! Well, you certainly got my attention! I have seen the book reviewed before but was sure I could handle the inevitable stress at the time. I think I can handle it now and I really appreciate you reviewing the book and bringing it back to my attention. I shall order it now, and read it when I finish the book I am currently reading. No, I won't let you wrestle my current book from my hands :) I do want to read it though and decide first hand, without other influence, what I think of the major character you mentioned. I didn't watch the video! Yet!!! But, I'll be back after I read the book. I've read this book and I loved it. I want to read it again. I had no idea that this was a part of our history. A definite must-read. I too read this book for bookclub and was really glad I did. It was a wonderful book with lots of great insights into history. I think that is what I like about book club. It gets me to read books I probably would not have picked on my own. This one was a real winner. Thanks for the review. Thanks, Ladies for your visits and kind comments. We'll wait to hear back from you Cynthia. Dawna Rae I rarely read a book twice because there are always so many new books to read but if I did, this would be one to put on that list. Mary Beth I agree with what you said about a book club stretching horizons though this is a book that I would have chosen on my own. I have returned today, as promised, because I just finished reading "Orphan Train". It is a deeply touching novel, one that I honestly felt the author took her time on and developed her characters carefully in a very realistic way. Because of this review, I expected it to be emotional. How could it not be with every child being an orphan. I had no trouble whatsoever accepting the many different kinds of abuse discussed and described in the book. Those kinds of things happen to children who are born into a household, into a community way too often. During the years of the Orphan Train in American history, mere existence was difficult for most people. Many parents wanted to give birth to boys so they could help on the farm and girls so they could help with the children. I also had no trouble understanding that they would give back a child from the orphan train. I'm sure they would have viewed it as reversing a mistake for whatever reason. I also completely accept the idea that women would be quite jealous of a female child whether the jealousy was well-founded or not. My only pause, and I had to stop reading for a while to think about it, was the decision Vivian made during the war. After a few hours of contemplation, I decided it could easily happen exactly that way. People who are so devastated and who have already suffered so much in a few short years, could well make the decision to take what seemed like the easier path. I also considered that with all of the tragedy in her life, she might have felt cursed. I could even imagine her thinking a life was saved by the decision. Overall, I would say it is a great book and that I would highly recommend it with one exception. It does use a lot of expletives that I am not used to reading (of course I hear them) and it does get a bit too graphic at one point, but even all of that was realistic. Still, as long as readers understand things get a little "tough", then I would definitely recommend reading it and I thank you for recommending it to us Brenda. It was well worth reading! Wow, thank you very much for your spoiler-free review, Cynthia. You did a great job of discussing the issue without actually saying what it was. I am glad you thought it was worth reading. I'll add your cautions to my text above.